Welcome to Frocks & Frolics! If you want to experience that wonderful feeling of creating something truly beautiful and well made, then I have all the tools for you, right here on this site. It's perfect whether you are a newbie and want to learn the basics or you already are a sewing veteran. I created hundreds of videos for all levels of experience. It combines sewing technique videos with extensive video support for my pattern collection. 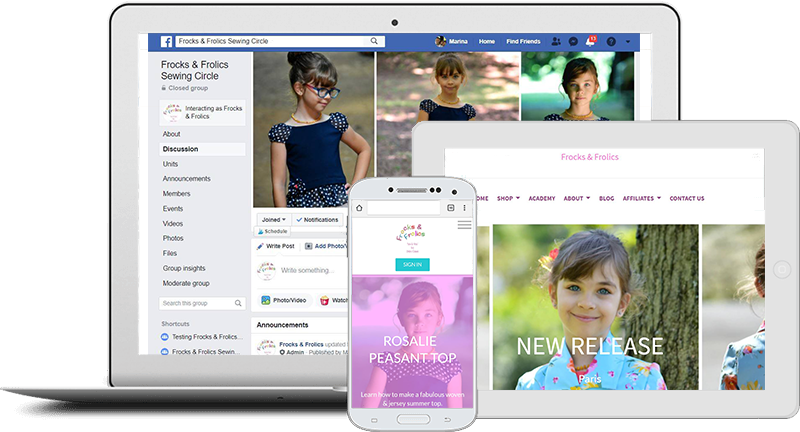 Joining our Academy/members area is free, so sign up and browse to find your first project with Frocks & Frolics. If you want to start sewing or looking to expand your skills, Marina is your online 'sewing guru'. She leaves nothing out and is always there to help you when the going gets tough. She is a total pro, having trained as a tailoress and teacher in her twenties, run a manufacturing business for many years and taught students in her popular sewing courses. Marina loves a challenge, which is why her patterns include some pretty awesome techniques you are unlikely to find anywhere else. I am so proud of all my sewing friends achieve here! They make some awesome stuff with my patterns and their positive feedback says it all really. These ladies are all real and you can meet them in our Facebook group. For more reviews just pop over to the main site and look at the listings and of course leave your comment too once you have made something amazing! This pattern is amazing. It goes together nicely. The video is extremely helpful. The finished shirt is finished beautiful inside and out! Thank you! This is a fantastic dress pattern! The videos make it so easy to follow and the directions are well explained. I easily modified it into a Cinderella dress so it works great as a base for any princess dress! The best pattern that I've ever used since I began sewing. Easy to use and you can understand the direction so much better than the american patterns, the fit is amazing. Let's face it, everything in our shop is a bargain already! But I want to you to really start that sewing journey with a BANG, so I have some extra special goddies for you here. Enjoy! NO SPAM - JUST NEWS! Get offers and updates in our monthly Newsletter. I am always on to the next fabulous sewing pattern, so don't miss out on the Newsletter only offers! Who would have thought a video that long (60 minutes) would be one of my most watched videos on You Tube? I guess it is the amazing detail in it and techniques people hadn't seen before. "Now I get it! Thank you so much" is what I here every day from my students. I am so glad I could create this amazing pattern for you. I don't belieeeeeeve it! Why did I do that????? Everything is easier when its shared with a friend. Success is sweeter and disappointment shared can soon turn into another funny story you can share. Let's face it sewing involves the use of that handy seam ripper quite a bit! 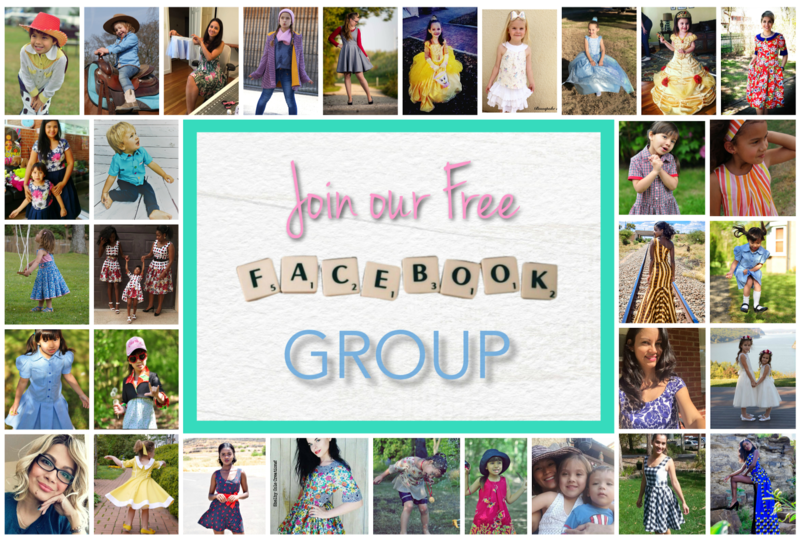 So join our group of sewing friends on Facebook. Your favorite blog posts all in one place! FREE for members! 1. Do I get the patterns and the sewing course? Yes! You get the patterns in letter size format for the USA and Canada and DIN A4 format for the rest of the world. 2. Your patterns come in lots of files. Why is that? When I taught sewing courses the standard multi-size patterns were difficult to use. There wasn't enough space and they were very flimsy. So I practically did what others call 'layering' only I went a step further and separated the pattern sizes. Now each size has its own file, preventing a lot of paper waste. Just print the size you need. 3. I bought my pattern on a different site, do I still get access to the course here ? Absolutely! I can add you manually to the course. Just pop me an email with the platform name and email used and I will find your order. Just give me a day to do it :) If you want to use mainly the academy then please also purchase here, to make things quicker. 3.Why do you have two sites: The academy and frocksandfrolics.com? Frocksandfrolics.com has all the bells and whistles of a great store and blog. It has great checkout options and fabulous integrations but the patterns can only be downloaded for 30 days via a link. The academy is our member site which will keep your patterns indefinitely. I automatically add you after purchase. An email is send to you to set up a password and off you go, start learning and sharing. 4. This site is in English, do you still do German instructions? Yes! Unfortunately most platforms don't offer multiple language sites. So I kept the landing pages in English but added all the German content to the course. This includes the patterns and all the videos. 5. Do you offer beginner sewing courses? I am working on several singing and dancing courses now, which will combine a number of patterns and give you many basic sewing skills. For now please enroll in our free Sewing 101 course for all the basics. 10. Do you do pattern drafting courses? We are working on those for you too. We will include courses for grading, corset making and bridal. We will also offer pattern blocks at frocksandfrolics.com. In October 2018 we will officially start our advanced courses! Begin your sewing experience now!